I’m getting the hairy pony eyeball, because I am taking her picture instead of getting ready to mount up for our first trail ride since the beginning of October! 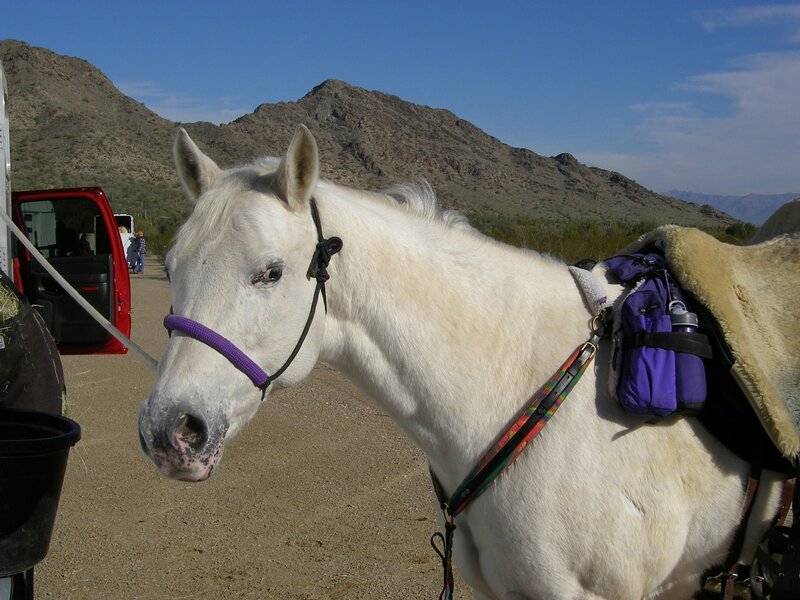 Yes, that’s right, I did remember I’m supposed to be a quasi-endurance rider with an endurance pony. We only went our for five miles or so, all walking. Mimi feels good, but again, it was just walking. Her odd movement only shows up at a trot/canter, although the last time I rode her in the arena, she felt good. Maybe it was adrenaline, because she was rather amped up from the cold weather and being stall-bound for four days while the pasture dried. But even that shouldn’t effect something like her mechanical lameness, for lack of a better term. So we’ll see what happens. We’re going to slowly start bringing them back. Beamer’s face is all healed from his encounters with sharp pointy objects. Dad futzed with his saddle pad and created more of a bridge across Beamer’s spine, and it appeared to be working to keep the saddle more elevated in the back. And Mimi? Only time will tell. At this point, 50s are out, and will be out for her for her lifetime. I won’t ask her for that kind of effort. 25s are enough to keep her satisfied, so I will be thrilled beyond measure if she can come back enough to do that. I don’t have the time to keep her in shape for 50s…or myself for that matter!